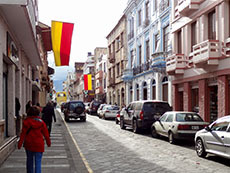 Right on the equator on South America’s Pacific coast, Ecuador is a fascinating country. It’s exceptionally diverse, a combination of ancient and colonial civilizations, as well as some of the most amazing natural splendors on earth. 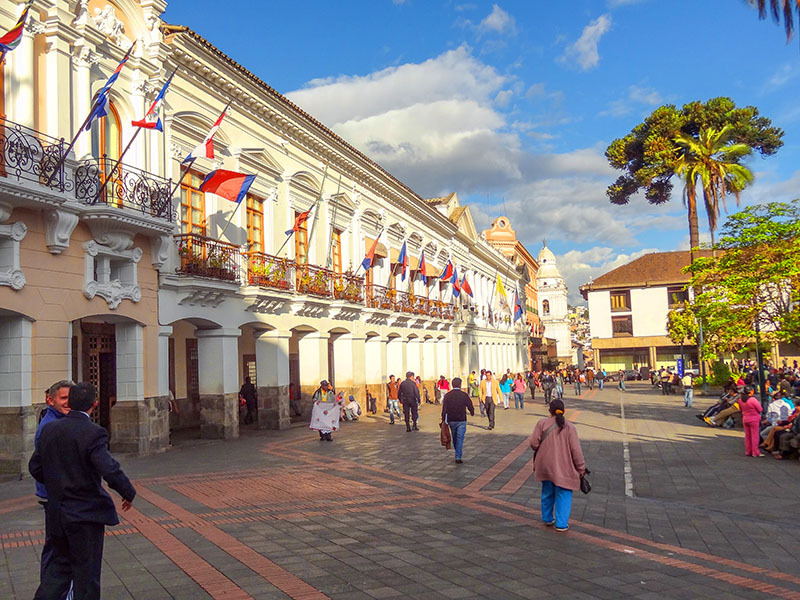 While many go to Ecuador primarily to visit the Galapagos Islands, there’s much more to the country including some of the best colonial cities in South America, colorful Indian markets, rainforests and jungle. What’s great about the country is that it’s relatively small, making it easy to see different areas in a relatively short period of time. And a surprise for many travelers is that Ecuador’s official currency is the U.S. dollar. Here’s a roundup of the best places to see in Ecuador. Quito, whose actual name is San Francisco de Quito, is an Old-World colonial city that like its Californian counterpart is also hilly. But unlike its California cousin Quito sits at an elevation of 9600 feet on a high plateau that’s only four or five miles wide and more than 30 miles long. Old Town is the largest and best-preserved colonial area in South America, so it’s no surprise that there are many churches in the capital. One is the Basilica of the National Vow, the largest neo-Gothic basilica in the Americas, an out-of-place looking gothic church whose Ecuadorian-style gargoyles include huge tortoises, jaguars, giant sloths and crocodiles. In the center of the Old Town is the Church of St. Francis, which the Spanish began construction on just a month after their arrival in 1535 and built atop an Inca temple. It’s close to the 16th-century La Plaza de la Independencia, also know as La Plaza Grande, once the main square of the city and still an attraction for many locals and tourists. Flanked on its four sides by the Cathedral, the Presidential Palace, the Archbishop’s Palace and the Municipal Palace, it’s the heart of the historic center. I fell in love with Cuenca, an interesting mix of French and Spanish-Colonial styles and one of the most charming cities in Ecuador. Sitting high in the Andes in the southern part of the country, it’s also home to a fairly large American ex-pat population and isn’t yet overrun with busloads of tourists. The main square of the city, the jewel of the town, is strikingly different from the other city squares since it was built in a French design, not Spanish. It’s beautifully laid out with walkways, flowers and trees all around. Business-wise the city is divided into different areas. One moment after leaving the main square we were walking through the “barbershop area,” then through an area filled with Panama hat-shops that catered to locals, then through an area of embroidery shops. Practically every block was dedicated to a different type of business. Don’t miss Cuenca’s Cathedral, the fifth largest in Latin America, an enormous structure in which a local artist integrated so many of the local influences into the stained glass he created. 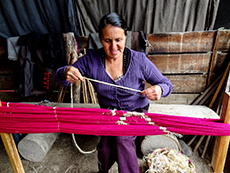 Outside of Cuenca in the Gualaceo Valley you’ll get a taste of local life as you drive along the highway. I passed may indigenous people in colorful clothes and wearing the customary fedoras, and roadside stands where large pigs on spits were being carved for motorists that stopped by for a bite to eat. In one old farmhouse we visited the family had developed a good side business demonstrating local weaving techniques to travelers. Not far beyond there was an orchid farm with the entire complex contained in a series of small greenhouses where nearly half of the 30,000 species of orchids in the world were being grown. 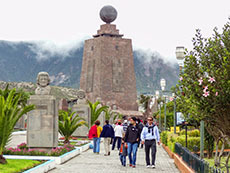 La Mitad del Mundo (the Middle of the World), is a nearly 100-foot tall Equatorial monument north of Quito that encompasses a small museum about the ethnic cultures of Ecuador. It’s only mildly interesting and the place tour companies shuttle you off to so you can stand right on the line “painted on the equator” for that memorable photo. But it isn’t really on the equator at all – the real equator is about 250 yards away. It was never intended to be a sham but due to a mistake made by a French expedition in 1736 that marked the wrong spot. Incredibly, the mistake wasn’t realized until relatively recently after the Global Positioning System (GPS) was invented. Unfortunately, since the Ecuadorian government had already built La Mitad del Mundo the tour companies continue to bring you there instead of to the “real equator” where some entrepreneurs have opened their own lively exhibit. 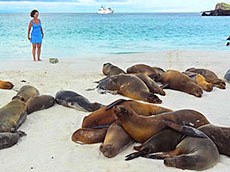 First made famous by Darwin on his historic voyage in 1835, the Galapagos is a mini-Jurassic Park of sorts, plopped in the Pacific 600 or so miles off the coast of Ecuador, about a 2½-hour flight from the mainland. It’s a place where you find species unlike any other in the world including marine iguanas that look like little dragons (the only sea lizards in the world), birds with blue or red feet, albatrosses with seven-foot wingspans and gigantic 100+-year-old tortoises weighing more than 500 pounds. The best thing about a visit to the Galapagos is that there you can get quite close to the animals and birds since they have no fear of humans. To protect the islands the Ecuadorian government has placed strict controls on what you can do on them, including limiting where any tour company can go on a specific day. It all works well since you no longer have four ships dumping hundreds of people onto the same strip of beach, and you don’t come across other tour groups as you hike through the interior. 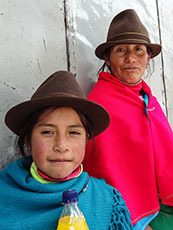 El Oriente is a huge area of the country – about 25% of its landmass – that extends from the Andes to the border of Peru. It’s also called Las Amazonas since it’s rivers carry the mountain snowmelt to the Amazon. 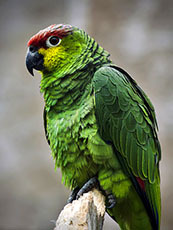 It’s a naturalist’s dream since 57% of all Ecuadorian mammals live in the area; you’ll also find 500 species of tropical birds and 15,000 species of tropical plants. As in the Galapagos, an eco-tourism industry has also blossomed here, with several jungle lodges now catering to international travelers. One of the wonderful things about visiting Ecuador is the opportunity to visit the indigenous Indian markets. Depending on the market you can find local Indians selling a wide variety of goods ranging from animals and produce to woven goods and handicrafts. 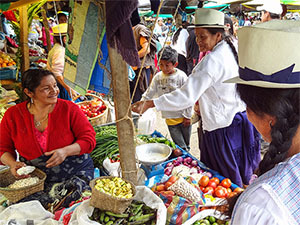 The market at Otavalo, about two hours north of Quito on the Pan-American Highway, is the most well know of the markets but also the most touristy. The Sunday market at Gualaceo, about 40 minutes outside of Cuenca, is a bit more authentic. 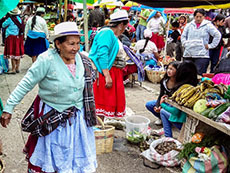 Other markets include Cotacachi (famous for its leather works), about a half hour north of Otavalo, and Saquisalí, two hours south of Quito. South of Gualaceo is the town of Chordeleg, famous for its silver jewelry. You’ll find it sold in many shops in the center of town.